This story was originally published on the Materialise Medical Blog. Dr. Wippermann is the clinic’s chief physician for trauma and orthopedic surgery. For the first time ever, he contacted Materialise to see how 3D Printing could help. Because of the patient’s congenital hip condition and her two previous surgeries, the bone condition was less than optimal the surgeon deemed it too difficult to treat with a conventional implant. With the engineering expertise of the Materialise Clinical Engineer, Dr. Wippermann was able to draft a detailed surgical plan to prepare before the procedure, which entailed replacing the patient’s failed hip implant with the 3D-printed aMace hip implant. Antzelina Kesidi was born with hip dysplasia. During her childhood, her pelvic bone did not fully ossify and one leg was 5cm longer than the other. The operations began in adulthood, the first taking place in Russia when she was 24 years old. She received bilateral prostheses. When this failed eight years later, she had revision surgery performed in Greece, also without success. Another eight years later – because the Cypriot Ministry of Health works in cooperation with the HELIOS Clinic in Germany – Antzelina went to Hildesheim with renewed hope. This is when, during surgery number three, she received the aMace implant. At forty years old, she was pain-free after surgery and is now looking forward to playing with her 10-year-old son properly. After Dr. Wippermann made contact with Materialise, he sent through a CT scan of the patient’s hip. Materialise then created a 3D virtual visualization of the patient’s pelvis to allow the surgeon to examine the defect in more detail. The bone quality of the hemi-pelvis was also taken into consideration and measured. Based on the Surgeons clinical instructions, Materialise designed an implant to reconstruct the pelvic defect, taking in consideration the optimal position of the screws based on the bone quality of the hemi-pelvis. 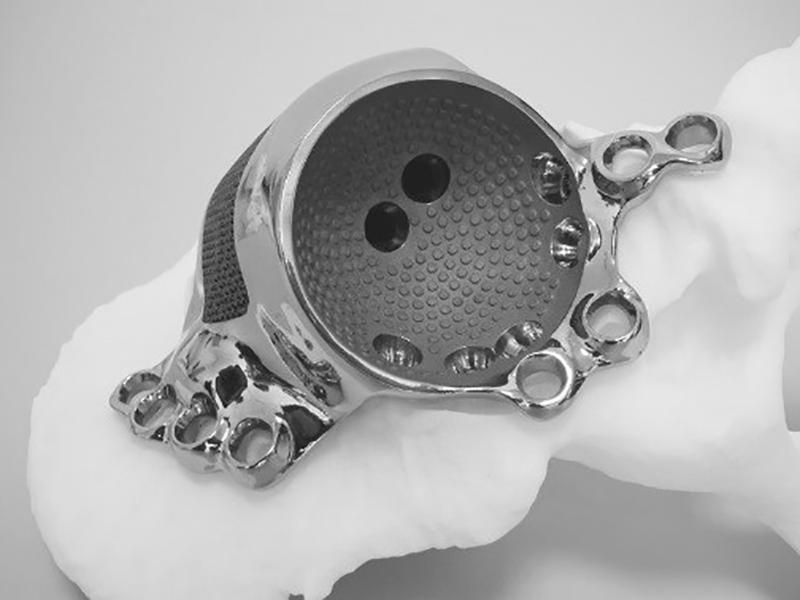 The next step was for Dr. Wippermann to create a surgical plan, based on the implant design and planning guidelines provided by Materialise’s clinical engineer. The final step was to 3D print the implant with a titanium alloy. 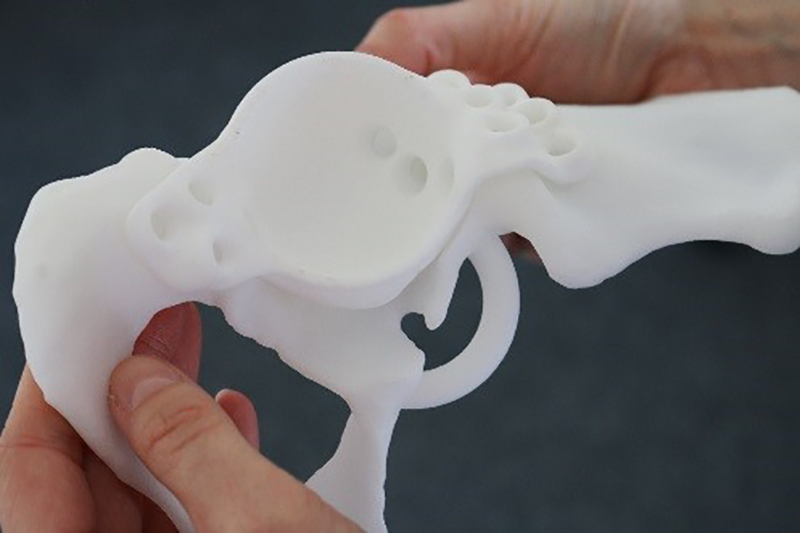 Materialise also provided, as part of the aMace solution, an exact replica of the patient’s hemi-pelvis for the surgeon to use as reference for pre-operative planning and use during the surgery. In addition, a replica of the implant and guiding tools for the screw placement were delivered. All items were printed in plastic. Why use the aMace implant? The aMace implant is not just a pretty implant. The carefully planned orientation, position of the center of rotation, and the fully tailored implant should provide enduring stability, even for challenging cases where this is hard to obtain with standard components. The planned screw positions are based on the patient’s bone quality, as well as the guides that help for the planning of the surgery and during the surgery itself, enable a solid initial fixation. Additionally, the porous materials at the back of the implant enable bone ingrowth, which is essential for a long-term fixation. After a three-hour procedure, both surgeon and patient were very pleased with the outcome. Happy patients’ stories are what we like to contribute to because we believe in making the world a better and healthier place. Contact us to find out more.